Ultrasonic Oscillator is the main part of high-power ultrasonic system, include booster and Transducer (converter). Ultrasonic booster can change the amplitude of transducer. Booster is a passive device and cannot produce vibration itself. It is only to output after the input vibration is changed into amplitude, and finishing the impedance conversion at the same time. Under the stimulus of electric field, ultrasonic transducer can produce regular vibration and the amplitude is about 10μmm commonly. That is not enough to finish the welding and processing step directly. Through with the suitable booster, the amplitude of ultrasonic can be changed in a large range. 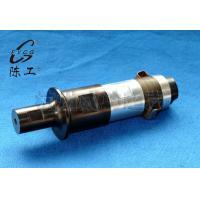 Ultrasonic Oscillator is used for ultrasonic cutting machine. It’s the core of ultrasonic cutting equipment. ★ High mechanical quality and excellent electro-acoustic conversion efficiency, providing a high output amplitude. ★ Piezoelectric element offer a high speed of vibration. Through bolt-on mounting, mechanical intensity and amplitude have been improved. ★ Having steady output amplitude even the load markedly changed. ★ Extended using temperature, ensuring good amplitude linearity. Lower resonant impedance, ensuring high conversion efficiency. ★ Bolt-on mounting gives the fast, easy installation and high reliability.